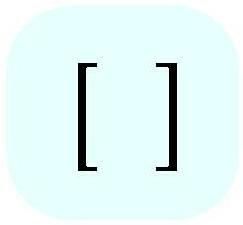 Left "[" square brackets, and right "]" square brackets are used together. They can be interchanged with parenthesis or braces. However, if there are three levels of grouping in a nested expression, generally parentheses are used in the inner most groupings. Square brackets are used in the next higher level grouping, and braces are used in the most outer groupings (see "Nested expressions" for an example).
. . . Click here to see the three examples demonstrating the use of parentheses.
. . . Replace the parentheses with square backets in the mathematical expressions illustrated.
. . . The step-by-step procedure for evaluating expressions using square brackets is exactly the same as the step-by-step procedure for evaluating expressions using parentheses.